While putting some of my Bowman prospect cards in order I stumbled across something interesting. There is an error on this card. You figure it out. Anyone else find other errors in the 2011 Bowman Chrome? 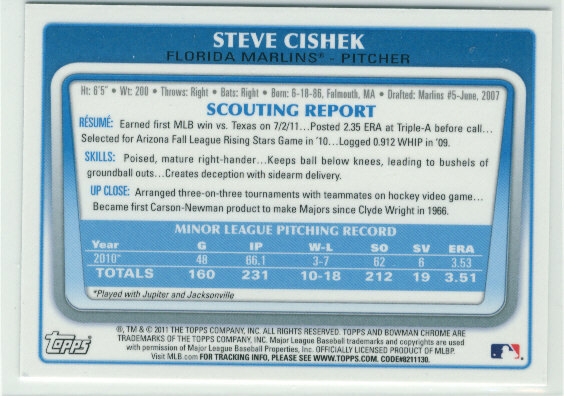 I documented all the changes to the Bowman Chrome prospect inserts from the checklist inserted in packs to the actual card numbering topps went to press with. there are like 7 players affected. major topps blunder. They shouldn't print those pack-inserted checklists until they have all their t's crossed and i's dotted. OTOH, it was fun project to spend an hour with the cards figuring things out so I could see if I had all the base cards for my set. No, that's just the latest unannounced parallel. 1:71 packs has an unnumbered card. I don't know if this is an error or not. Both say 1st Bowman Chrome Card, it is the same guy. Both Bio's match. I will try and get a scan up in the morning. 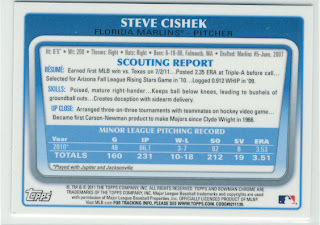 I do seem to recall the home area kid has a 2009 bowman chrome card so Topps was in error in their labeling. I also beleive that, despite it being listed in Beckett, there is no 2011 Green XFractor card for Heredia (#171). I spent months trying to track this down to finish the set with no luck and lately have seen the card listed as NA on several other lists.